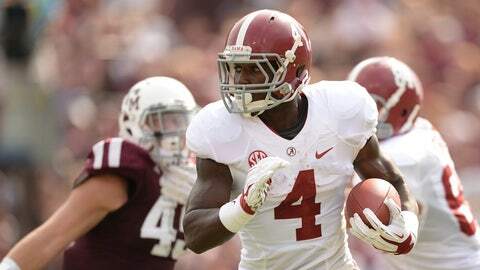 Alabama sophomore running back T.J. Yeldon logged six 100-yard rushing games in 2013. In the Iron Bowl shocker against the Auburn Tigers, the same team now playing for the BCS National Championship, Alabama ran up 218 rushing yards and one score on the ground. Sophomore running back T.J. Yeldon accounted for 141, while Kenyon Drake and star receiver Amari Cooper pitched in. However, in the biggest game of Gus Malzahn’s head coaching career to date, the Tigers were able to come up with some key third- and fourth-down stops, including a stonewalling of Yeldon on 4th-and-1 with under six minutes to play to alter the course of college football history. Now, Oklahoma will have to do the same. Alabama brings one of the more balanced offenses in the country to New Orleans, and the Sooners front seven in particular will have to find ways to stop the run and get off the field on third downs. Boasting the 21st-ranked rushing offense in the country, the Crimson Tide are converting more than 47 percent of their third-down conversions (18th-best nationally). On the other hand, Bob Stoops’ defense gets off the field in such situations better than almost any team in the country. The Sooners have struggled to stop the running game against quality opponents this season, though. Notre Dame, Texas, Baylor and Oklahoma State — the top four teams on Oklahoma’s schedule — averaged 232.5 yards per game on the ground against the Sooners. Oklahoma lost two of those games and have yet to see a team quite as good as Alabama. Look for sophomores Charles Tapper, Eric Striker and Frank Shannon to try and get behind Alabama’s line and make some plays in the backfield, because if not it could be a long day of first downs against the Big 12 challengers. Amari Cooper is still the most explosive offensive weapon in Alabama offensive coordinator Doug Nussmeier’s arsenal. The sophomore was quiet throughout the campaign while battling toe and foot injuries, failing to hit the 100-yard receiving mark in the first 11 games (even missing the Colorado State and Georgia State games). But if there was ever a doubt as to how effective Cooper still is as a deep threat in Alabama’s offense, he squashed it with his Iron Bowl performance: six catches, 178 yards and one touchdown. Going back to last season, Cooper has four career games of at least 100 yards and one touchdown against ranked opponents, including his two scores against Notre Dame last January to help secure the Crimson Tide’s third national title in four seasons. Fellow SEC receivers Jordan Matthews (Vanderbilt), Mike Evans (Texas A&M), Jarvis Landry and Odell Beckham (LSU) put up bigger numbers this season, but with so much time off, a healthy Cooper could find himself behind the Sooners’ secondary a few times. 3: The Crimson Tide finished the regular season with a top-five scoring defense for the fifth straight season after holding all but three teams to 10 points or fewer this season. In Oklahoma’s two losses (Texas, Baylor), the Sooners offense, especially the passing game, could not get off the ground. This game will be played on Jan. 2 in New Orleans, meaning Nick Saban has more than a month to prepare for the Sooners and get his program over the stinging loss to Auburn in the Iron Bowl. Conventional wisdom says that’s more than enough. Since the Alabama’s dynastic run began in 2009, Saban’s teams are 5-0 following a loss and 4-0 in bowl games. Oklahoma boasts similar post-loss success, but these two programs are on different levels right now: The Sooners have not been a major player in the BCS title race since 2008 while the Crimson Tide were perhaps a last-second touchdown return on a missed field goal — perhaps the greatest play in college football history — away from their fourth national championship appearance in five years. Does that factor into this particular matchup? Not really. But there is a reason Alabama has found that success. Saban’s defense is ranked in the top-15 in both rush and pass defense, and now it gets a team that has often become one-dimensional on the offensive end under quarterbacks Blake Bell and Trevor Knight. Oklahoma ranks 101st nationally in passing after being held under 150 yards in games against Louisiana-Monroe, West Virginia, Texas and Iowa State. Obviously, Auburn found success on the ground in the Iron Bowl, but being able to attack a Saban-coached defense just one way is rarely a recipe for success. The Sooners should find some success defensively — at least a little more than they found against Texas A&M in the Cotton Bowl last season — but as long as Alabama hasn’t tuned out after missing out on the title, this has all the makings of a mismatch. Here’s Stoops’ shot at disintegrating the SEC’s aura, though.